November 30th is my Mother's birthday, and the days of boring store-bought gifts are gone! About half a year ago I purchased a 3d printer in hopes of learning to design and manufacture awesome projects and trinkets. The initial struggle was figuring out an awesome personalized gift for her, but eventually I stumbled upon the perfect idea. After I leave for college, I want my Mom to have a memory of my voice when I am not there. As a gift, I decided to 3d model and print the sound waves that are produced when I say "Happy Birthday Mom! I love you!" I created both a hangable "picture" and a necklace pendant. Both of the final products came out really well, and my Mom loved them! (See step 9 for a picture of my mom wearing the necklace!) In this detailed tutorial you will learn how to turn any recording or voice into a 3d model for free! I hope you can follow along, and please vote for this instructable in the 3d printing, homemade gifts, and new author contests! Check out step 8 to download the files I designed! 1. Find some way to take a picture or screenshot of the sound waves. 2. Import that picture into Fusion 360. 3. Trace the sound waves using the sketch tool. 4. Extrude or revolve the profiles to make a 3d object. 5. 3d print the finished .stl file. Now lets dive into the specifics! I will guide you through completing each task I have listed for the remainder of the instructable. - Super glue to assemble the final product. In order to 3d model the sound waves in Fusion 360, we must have a picture to trace. All of these steps are described with the above pictures as well. 1. Go to Sound Viz and log in. 3. Before you do anything else, click the small link at the bottom of the page that says Create your own. 4. Make a recording and allow Chrome to use the microphone. Make sure to end the recording immediately after you are done talking to avoid black space at the end. 5. Now you are back at the original menu but with a new recording. First, choose a nice bold color scheme that will be easy to see in Fusion 360. I used ARVO. 6. For style, choose linear. Next, it is crucial to make the box very wide. I slid the slider all the way to the right for width. This way there will be less rectangles to trace later on. Lastly, slide the Shape slider all the way to the left as we want the bars to be perfectly rectangular. I posted a screenshot of my settings above too. 7. Don't input any text. If you want some words on or near your sound wave, they can be added in Fusion 360 later. 8. Enter full screen mode, and take a screenshot! On a Mac this can be accomplished by holding down command+shift+3. 1. Open a new Fusion 360 document, and save it as whatever you want. 2. Click on Insert, then click on Attached Canvas. 3. Now press Select and choose your screenshot. 4. Open the picture and lay it down on the bottom of the modeling environment. Now you are ready to start 3d modeling! I ended up 3d printing this gift in two different ways. However, both required the sound waves to be sketched with basic two dimensional rectangles. In this step, I'll outline how I accomplished that. 1. Create a two point rectangle using the sketch feature. 2. Sketch a rectangle that is roughly the same size as the first bar. Don't worry if it isn't completely accurate as this can be changed later. 3. Finish sketching all of the rectangles! Don't lose hope, it is tedious but totally worth it in the end. 4. Once the rectangles are completed, use the Equal tool in the sketch editor to make all the widths of the rectangles exactly the same. Look at the pictures I included to tell if this is done correctly. 5. After you're done, turn off the light bulb for the canvas so that it disappears. This is the basic layout of the sound waves. From here, I made two completely different final products. First, I will be showing you how to revolve the rectangles to create an awesome 3d model that can be turned into a necklace or bracelet. Step 6: Version 1: Revolve the Rectangular Sketches to Create a 3d Structure. After I finished sketching the basic outline of the sound waves, I decided I wanted to create a small 3d printable object that could be used as a necklace pendant. My goal was to create something looking similar to this link: Sound Wave Necklace, but with my own sound waves of course. Make sure to check out the time lapse video I attached of me modeling this! 1. Choose the tool Revolve from Create and select one of the sound bars as your profile. 2. Revolve the profile 360° to create a full circle. For the axis. Select the smaller side (the width) of the rectangle. You may be tempted to select one line as the axis for all of the circles. However, this will not work, and it will create holes in each cylinder. Make sure that each axis is individual to the rectangle. 3. Move the first cylinder out of the way. 4. After you revolve the next profile, go to modify, and then align the centers of both cylinders. 6. Finish revolving and appropriately spacing all of the rectangle sketches. 7. Use the Loft tool under Create to bridge the gap between all the circles. Make sure not to use one continuous loft to link everything together. Only two profiles should be selected at a time, and also choose join as the final option on the submenu. 8. After everything is linked together with the loft tool, it should only be one body. If you examine your model right now, it likely looks very difficult or impossible to 3d print. You need to strategically split the model into several different parts that will be 3d printed separately and then glued together at the end. Remember this step will be different for everyone so don't entirely base where to split the model on my pictures that I included. 9. Measure how long the piece is. Depending on this and how you want it to look in the future, you may want to scale the model. 10. Right click on body, then select Save as stl to export the model. Save it to an easily findable location on your computer. I also made a hangable model out of the sound waves. Keep in mind that this description of how I created the hangable base is just to give you, the reader, a start. This process will be different and unique for everyone. Good luck! 1. First, I selected every single profile and extruded them to a height of 5mm. Don't worry about this exact measurement. Simply make it look evenly proportioned, and everything can be scaled up or down at the end. 2. Then, I drew a single rectangle that went through all of the sound waves. Use the join setting to avoid combining everything separately later. 3. Next, I sketched some three-point arcs around the model and mirrored a copy of them to the other side using a vertically central line I drew as the axis. After this, I extruded the face that was formed. 4. Then, I created a cylinder at the top and made a smaller hole inside of it. This is how I would nail it into the wall. 5. Measure the length of the model and scale if necessary. 6. Export the model using the Save as .stl button. The files I designed are available for you to download in .stl format. This is exciting! You're almost done! This is the order in which I finished the 3d printed parts and prepared them for gift giving. First, peel of the raft and remove all of the supports. This can be somewhat tricky for the smaller models, so be careful not to snap anything off! Second, you need to assemble the revolved sound wave model. Since the pieces will probably be very tiny, this can be difficult. I used a high-precision superglue bottle. Use your imagination to find different applications of the models. I ended up hanging one up on a wall, and I made the other into a necklace with string! Step 10: Some Ideas for This Technology. . .
After I completed this project, I realized that being able to transform sound waves into a 3d model could be used in many other ways. These are a few ideas I have come up with. Chess Pieces: All of the different chess pieces would be made out of the sound waves that are produced when you say their name. For example, I would convert the word "pawn" into sound waves and then 3d print a revolved structure! Flexible Bracelets: It would be relatively simple to make a bracelet out of a bunch of extruded rectangular sound waves. This would make an awesome gift! Learning Opportunities: Children learn and absorb information best when they are able to actually feel, touch, and interact with something. Science teachers could 3d print certain words and explain how invisible forces (like sound waves) are always bouncing around even if they may be impossible to see. Linguistics: Linguistics is the study of how languages come together. Linguists study the indentations of words and how loud each section is pronounced. 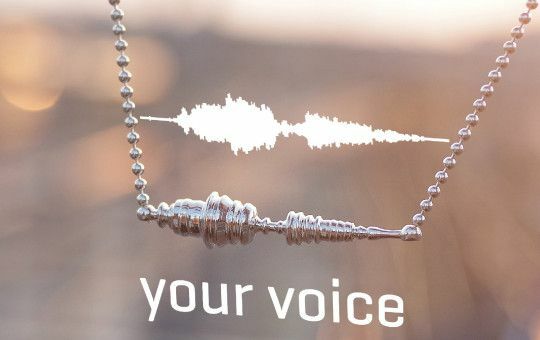 With the ability to fabricate a real life model of someone's sound waves, they could study and examine why some words are accented more heavily than others or where pauses are located in sentences and how long each one lasts. I have only scratched the surface of how this incredible process could be used. For absolutely zero dollars, average people now have the capability to produce amazing personalized gifts and create a note in the tune of planet earth. Please vote for this instructable in the homemade gifts, 3d printing, and new author contests! Thanks! Your mom looks familiar. Haha! Super cool idea and implementation! Muy buen trabajo ingeniero, CAD y electrónica juntos! Sería genial que grabaras las voces en anillos de compromiso de boda, cuando digan: Sí acepto! Gracias por la idea! Hay muchas maneras en que esta technologia pueda ser usada! Oh my gosh, I am sure that your Mom loved this! Lovely thought and idea -- and great job at spelling out the process clearly. Thanks! Thanks! I also watched the promotional video for what you're working on at your work and it looks very interesting! Neat! Now you can make your own! ignore.... shows you what I get for skimming. Again......great idea; nice job. I couldn't agree more. This is such a brilliant idea!